If you want power, accuracy and an aesthetically pleasing gun then the Norica Black Eagle is the gun for you. 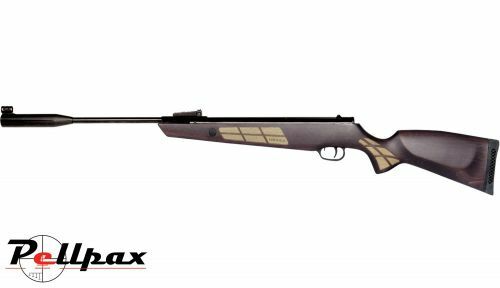 This gun has been designed with user in mind and is ideal for hunting or target shooting. The gun features a Sound moderator with a fibre optic front as well as a compact fibre optical rear sight. This allows you to clear see your target and reduces the noise to prevent giving your location away to other animals. The gun also has automatic safety which means when you break the barrel to load a pellet, the safety switch activates and has to be flicked back before the gun will shoot. This prevents the gun accidentally shooting when you don't want it too. This gun is sure to catch peoples eyes due to the aesthetics. The gun is crafted with a Vaporized beech stock with a water-based ink. This gives it that high quality finish but also protects it from general wear. The gun has Textured surfaces on the pistol grip and the forehand to ensure you get a secure grip for an accurate shot time after time. At the rear of the rifle the gun has a ventilated rubber stock. This allows you to comfortably shoot and absorbs the recoil preventing strain/injury to your shoulder. Add this item to your basket & spend an extra £346.01 to apply for finance.